When you look through the windows of our martial arts studio, you will see students working the action phase of a conflict – punches, kicks, and techniques designed to stop a physical threat. However, what you’re really watching is the growth of the confidence those skills instill in our students. A strong foundation in the martial arts gives children the ability to resolve and diffuse conflicts with their words instead of their fists. As Patrick Lyons, one of our Jr. Black Belt student instructors, describes it, “the first thing ever taught in Kenpo, whether or not the student realizes it. One’s first ever class [and every class] starts with the front position: right hand in a fist and the left palm over it. This symbolizes how you have your weapons learned from karate, your right hand, but they are covered and are only used when absolutely necessary, symbolized by your left hand. Words are always the way to go even if using my karate may be easier”. He’s right, throwing a punch is easier than offering friendship to the bully calling you names. Kicking a bully is easier than controlling your anger and frustration, telling them to stop, and warning them to stay out of your personal space when you’re being grabbed or pushed. There are times when fighting back is necessary, required, and the right thing to do when standing up for yourself or others, but, knowing their strikes will hurt and injure their opponent, our students learn to lead with kindness. Their words are the bully’s best option. Competence builds confidence. Join us at DHAC Martial Arts, Monday, October 1st and #blueup for our World Day of Bullying Prevention Open House, ages 4-6, 4:00-4:45 pm, and ages 7-11, 5:00-5:45 pm. Come and learn the verbal and physical skills to combat bullying. And just like that, Halloween and the first two months of the brand new school year are over. The challenges this academic year will bring for your child – new school, different teacher, academic trouble, changing social group, bullying, time management – are becoming more apparent. So, the question becomes how can you give your child the skills to face and conquer these obstacles? Tutor? Workbooks? Extra reading? Playdates? OT? The answer: martial arts. The latest trends in educational research reveal what a child brings to the classroom matters just as much as what the classroom can offer them. Mindset and attitude are the greatest predictors of success. That’s right, mindset and attitude. Building and fostering both are the foundation of what we do here at DHAC Martial Arts. We often ask our students what words, beginning with the letter “L”, embody what they do at karate. As you might imagine the chorus of response usually begins with listen and learn. Listening skills, gaining the ability to focus without distraction, and the self-discipline it takes to do this, are a staple of martial arts training. Beyond the how-to of punches, kicks, techniques, and forms, our students learn to take a hit both physically and emotionally. They learn the resiliency and commitment it will take to face challenges outside the walls of the studio. In a culture more and more defined by instant gratification and participation trophies, the value of earning what you learn and the sense of pride and accomplishment gained in doing so are often lost. Our students discover the joy of and love for the journey persistence and hard work creates. They learn it is okay to fail, and how even failure can be a positive thing. They learn to dare to make mistakes, to stand up for themselves, and to do what is necessary to help themselves succeed in any situation. So, when we push them to think a bit further on those “L” words, we get laugh, loyalty, inevitably a left hook or two, but we always land on love – most importantly, the love for oneself. This love gives the self-confidence to attack any challenge with the mindset and attitude to be successful. 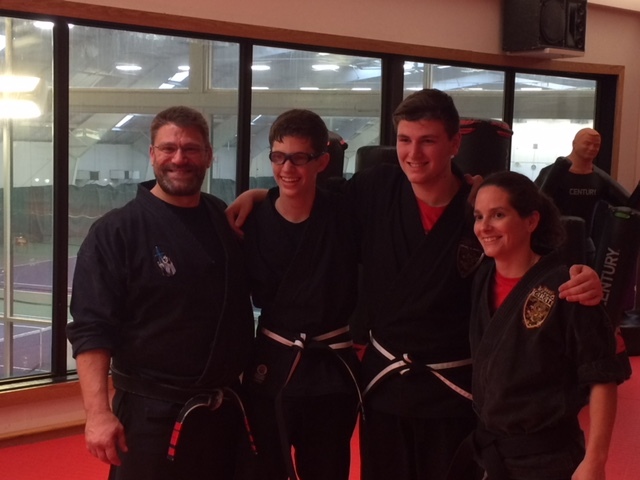 To learn more about our Martial Arts programs at Dedham Health, visit our website, here. We look forward to seeing you or your child in our Martial Arts studio.